Safety Wolf has closed permanently. Safety Wolf Paintball Field is an outdoor and indoor paintball field located near East Point, Hapeville, Panthersville and East Atlanta in Conley, Georgia. 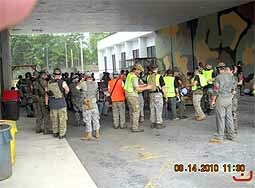 Safety Wolf Paintball Field is also convenient to Lake City and other cities in southeast Atlanta. See the chart below for distances and drive times to other cities and points of interest. Safety Wolf Paintball Field is one of the Largest Indoor paintball fields in Georgia. It is located on a former truckstop and motel. The location and size of the two story facility brings a special perspective make for an amazing paintball experience. 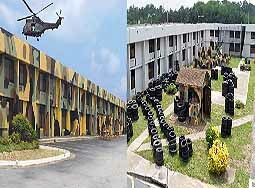 Safety Wolf Paintball Field is located on a 30 acre site including the 90,000 square foot indoor facility. This is not a misprint! 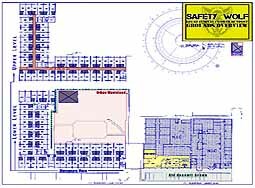 The indoor portion of Safety Wolf is 90,000 square feet. indoor. 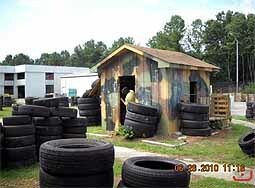 Safety Wolf Paintball Field also features a variety of other indoor and outdoor bunkers. 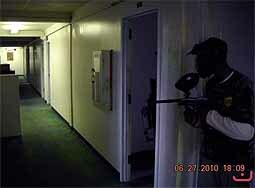 You'll find 100 rooms indoor and other outdoor fields on site as well. One field features a Comm Uplink area to defend. Another features a 200 foot long indoor fighting arena. There are also areas with camouflaged bunkers and tank bunkers. Safety Wolf Paintball Field currently has two outdoor courses. 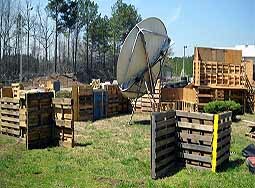 One paintball course features bunkers and barricades that they have constructed out of various materials. They make major changes every few months to keep things interesting for you. The other outdoor paintball course at Safety Wolf is a woodsball course. The safety area with plenty of people loading up to go out and play. There is also indoor area to get ready for groups. Look at the size of this place, amazingly huge indoor area. There are 3 essentially identical indoor courses at Safety Wolf Paintball Field. This allows them to accommodate several groups simultaneously. 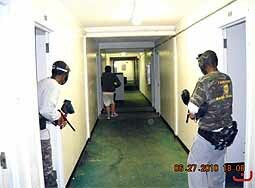 The Hall at Safety Wolf Paintball Field lends itself to several interesting types of games. The Alien target and shooting area at Safety Wolf Paintball Field. Note: Courses may have changed since these photos were posted and descriptions written. Safety Wolf Paintball Field has a grill, full kitchen and snack bar. Hot and cold food items are available at reasonable prices. Safety Wolf Paintball Field is a "Field Paint Only" paintball field. This means that only paintballs purchased from Safety Wolf Paintball Field on the day of play may be used at Safety Wolf paintball. For your safety and the safety of others, the consumption of alcohol or other drugs that may impair your judgment or coordination is not allowed before or during your visit. Do not bring alcohol onto the premises. Safety Wolf Paintball Field reserves the right to eject any player(s) without refund that its employees think may be impaired or bring alcohol or other drugs onto the premises. Safety Wolf Paintball Field is ideally located for people living or traveling in the Southeast corner of Atlanta, Georgia.